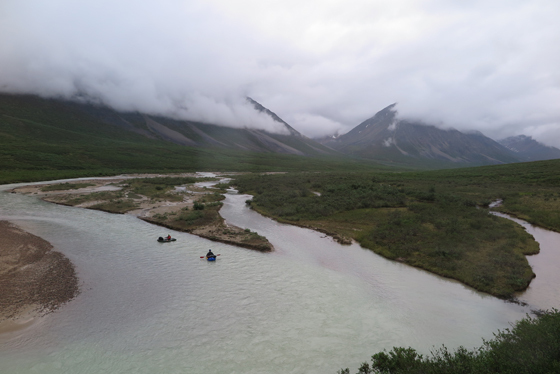 The low clouds and light mist of Alaska returned. The small Styx River was lower than the previous evening, and milk green instead of grey. A golden eagle flapped across the valley. A herd of twenty caribou spooked into the bush. Two seagulls dive-bombed me repeatedly, no doubt fending off the invaders from their young. Spruce trees returned as we dropped below 2,500 feet. 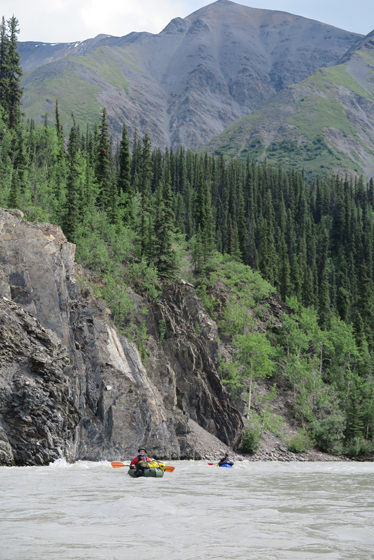 Canyon bluffs emerged, enclosing the river in a low canyon, sinking through the valley floor. Whitewater started. 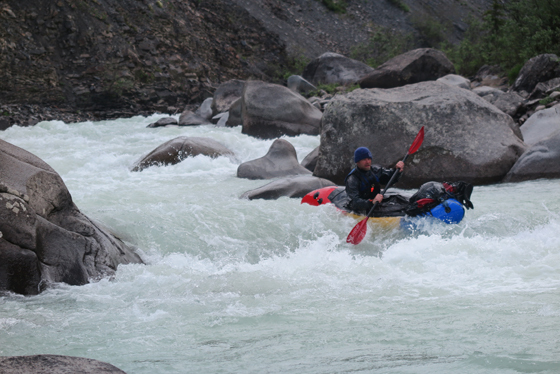 There was plenty of class III, and a couple standout rapids that were probably easy class IV. 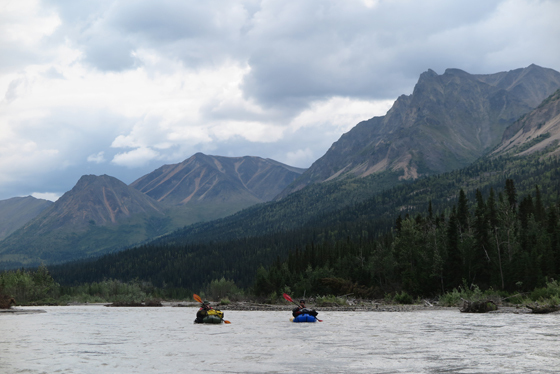 These were the rapids the previous kayak descents had sought. Our pack rafts handled it all quite nicely. Sunshine returned. At a hard left turn, two small patches of sand beckoned, guarded by a tall cottonwood and a spruce tree. We pulled in, an early camp for once. 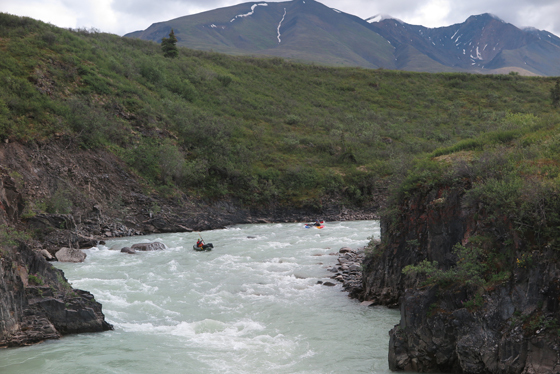 Swift corners led to the confluence with the South Fork of the Kuskokwim. 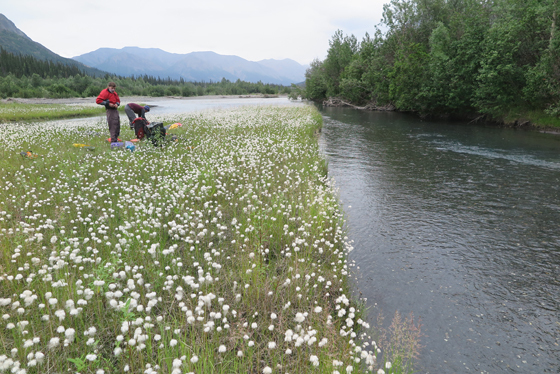 It ran a glacial brown, and more than doubled our flow. 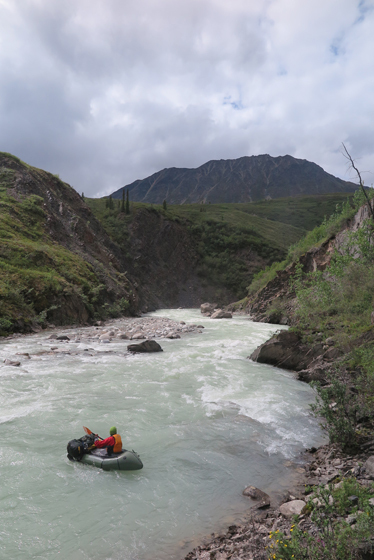 On a robust river now, we ran through Hellsgate, where the river cuts through the Teocalli Mountains. 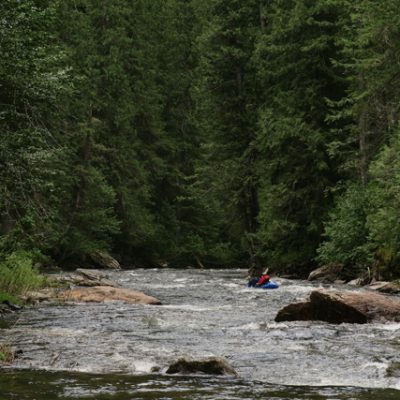 Class II water belied the ominous title, and soon we were on a fast smooth river running through the spruce covered Alaskan interior. An aluminum skiff sat on the shore, and a chainsaw whined in the distance. We pulled ashore and entered the woods, where we were greeted by a friendly young woman named Lexi. Her partner, Colter, showed up minutes later. During our 30-minute visit, both stood mostly bare amid the passing mosquitoes. True Alaskans. By evening, clouds were gathering once again. We’d have liked to have pitched the tents and relaxed, but the days were ticking away toward our pick-up date with a bush plane, and we had mountain ranges yet to cross. 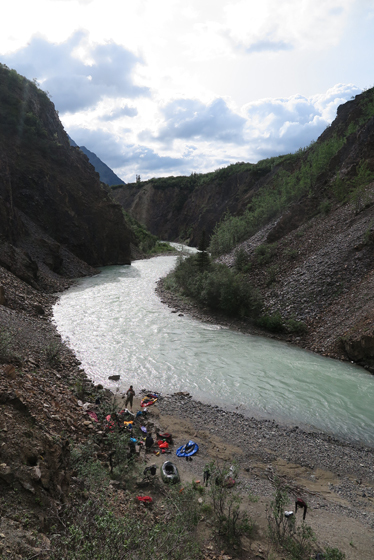 So, at 6 pm we found ourselves de-rigging our boats and re-rigging for hike mode. This was the confluence of Denny Creek, our key to Goodman Pass, and eventually, the Happy River. With rain spattering and skeeters buzzing and an unknown bushwack before us, our mood was determined, even stoic. We were stepping into the bush.